Each line is now the actual experience with its own innate history. It does not illustrate—it is the sensation of its own realization. Gagosian New York is pleased to present a group of the last paintings and sculptures of the late Cy Twombly, many of which have never been seen publicly. 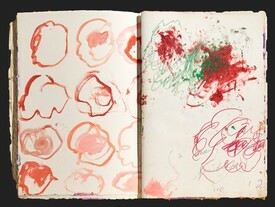 Throughout his sixty-year career, Twombly infused the physical and emotional aspects of Abstract Expressionism with a wealth of historic and mythic allusion. He combined elements of gestural abstraction, drawing, and writing in a highly idiosyncratic and potent expression. At once epic and intimate, his work is steeped with references to poetry, classical mythology, and history. The alternation between the visible and the hidden, between present and past, and the struggle between memory and oblivion are unifying themes in his work. 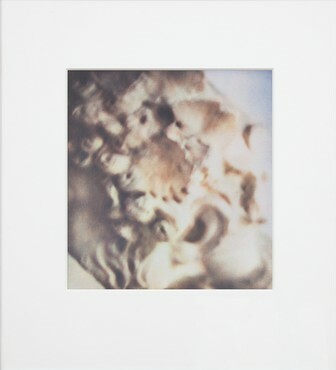 The Bacchus series (2004-08) is charged with visceral energies. In huge arcs and drips of sanguine paint, sensation courses through the annals of myth and history. 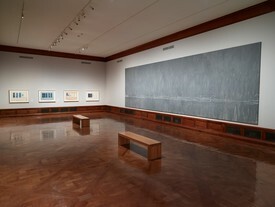 In later untitled works, cursive white lines against dark blue fields similarly describe the gestural force that first appeared in the “blackboard” paintings of the 1960s and early 1970s. 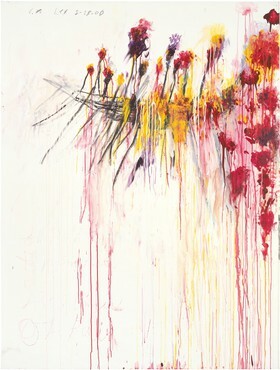 Blooming (2001–08) is an efflorescent ten-panel painting spanning more than sixteen feet in width. 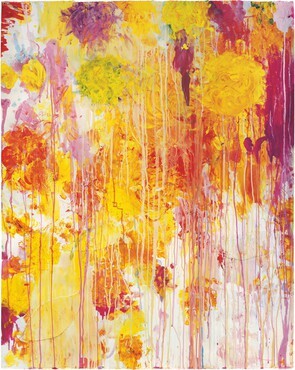 Twombly captures and memorializes in patches of lush crayon and paint, and drips and flows of startling color, the fragile, heady nature of the peony flowers so revered in Japanese aesthetic contemplation. 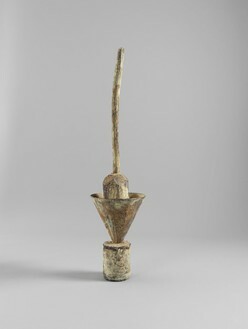 From 1946 until his death in 2011, Twombly created sculptural assemblages from found materials and objects—kitchen utensils, cardboard, leaves, and other debris—unifying the final form with a coat of dry white paint. In 1979 he began to cast some sculptures in bronze, thus preserving and transforming the disparate elements. The surface and patina of these cast bronzes evoke weathered artifacts exhumed from the earth; some contain allusions to Egyptian and Mesopotamian sculpture. 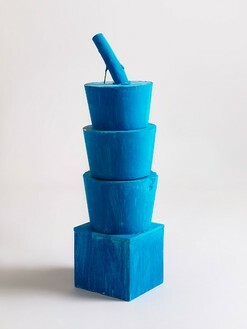 In works such as the obliquely stacked form of 2009, components have been merged and abstracted in the casting process; in others, such as Untitled (2004–09), there is an ecology of carefully balanced objects—a broom inside a funnel resting on a cylinder. Never before seen, Untitled (2004) is a sculptural monochrome of cast plaster and wooden elements, painted freely in brilliant sky-blue. Twombly’s enduring importance to the art of the present is attested to by recent survey exhibitions in leading international museums. He has been a cornerstone to Gagosian since its opening in New York in the 1980s, and many exhibitions of his work have been presented over the last twenty-five years, each one as memorable as the next, from Bolsena Paintings (1989–90) and The Coronation of Sesostris (2000–01) to Lepanto (2002), Bacchus (2005–06), and The Rose (2009). 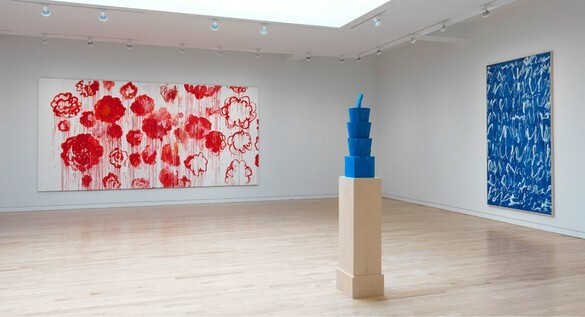 Ten Paintings and a Sculpture (2004), Three Notes for Salalah (2007–08), Leaving Paphos Ringed with Waves (2009), and Camino Real (2010) inaugurated new galleries in London, Rome, Athens, and Paris respectively. 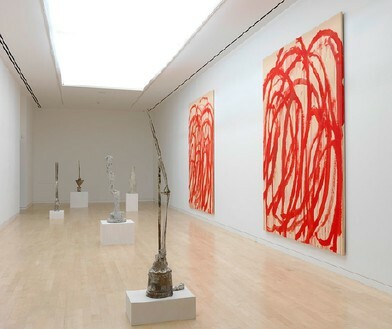 Twombly’s exhibitions The Last Paintings and Photographs toured Gagosian Los Angeles, Hong Kong, London and New York in 2012. 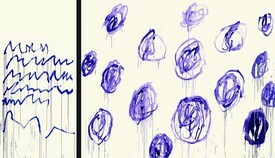 The exhibition is presented in collaboration with the Cy Twombly Foundation. 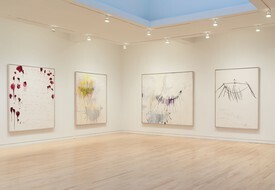 Mark Francis, director of the exhibition Cy Twombly: In Beauty it is finished, Drawings 1951–2008, describes the impetus for this expansive presentation, the source for its title, and details the stories of some of the works on view. Cy Twombly’s Coronation of Sesostris (2000) receives a closer look by Gagosian Director, Mark Francis. In this video, he discusses the history of the work, the myths and poetry embedded within it, and considers its lasting impact. 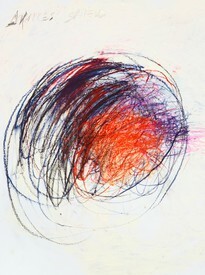 Katharina Grosse reflects on the work of Cy Twombly. Olivier Berggruen and Mary Jacobus spoke about the works in the inaugural exhibition at Gagosian’s Grosvenor Hill outpost. On the occasion of the Morgan Library and Museum’s exhibition of Cy Twombly’s monumental painting Treatise on the Veil (1970) and related drawings, Gagosian director Mark Francis speaks with Isabelle Dervaux, Acquavella Curator of Modern & Contemporary Drawings at the Morgan.